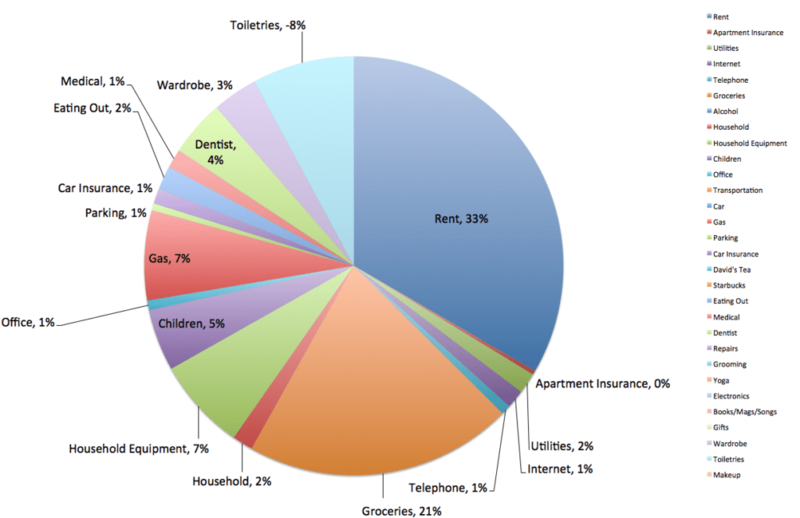 January 2015 Budget Roundup = $300,580.68 +$6276.59 or +2.09% | Save. Spend. Splurge. My childhood friend died from brain cancer today. She left behind 2 children and a husband who is struggling to piece their lives back together. I wasn’t super close to her in school and I didn’t really keep in touch after primary school, but her death hit me in the gut nonetheless. She was my age. I thought about her all day. Honestly, I had no idea WTF Instagram was but if you use Twitter, it is like Twitter but with pictures and videos and a much longer message space available. I’m using it to mostly document stuff I wear…. Follow me on Instagram OR on Twitter. I am on both now. And on Facebook…. and a ton of other sites. Just check out the sidebar to the right under KEEP IN TOUCH. I have to keep reminding myself that I am only in my early 30s and frankly, it is a damn miracle that I make the income I do and work the hours I do. I still have 30 years to go of this kind of income potential and quite honestly I will probably retire early. It’s just hard because I’m (stupidly) comparing myself to people in their 40s and 50s. I have to remind myself that they didn’t start at the income I did at my age, they may have just started only about 10 years ago (at the same time I did), but have more experience than me but not necessarily in our jobs (essentially, I have the same years). I am not earning THAT much less per se, but being the kind of alpha personality that I am, I am expecting to earn at least the same amount or more because we are essentially doing the same job, and I am seeing that I am doing a better job because I’m not just being an egomaniac, it’s a fact. I’m delivering results and they aren’t. Still, I have to smack myself (figuratively) and keep things in perspective because I’m in a very small career niche, much like in personal finance blogging, and it can be hard to see the big picture when you’re in this bubble and everyone seems to be doing better than you. I think I’m going to need to ask for more money. I am doing really well. I’m even selling stuff from my wardrobe. A lot of it has sold already but.. there’s still some stuff left. I’ll be selling all year. I’ll keep the page up and update it on occasion. 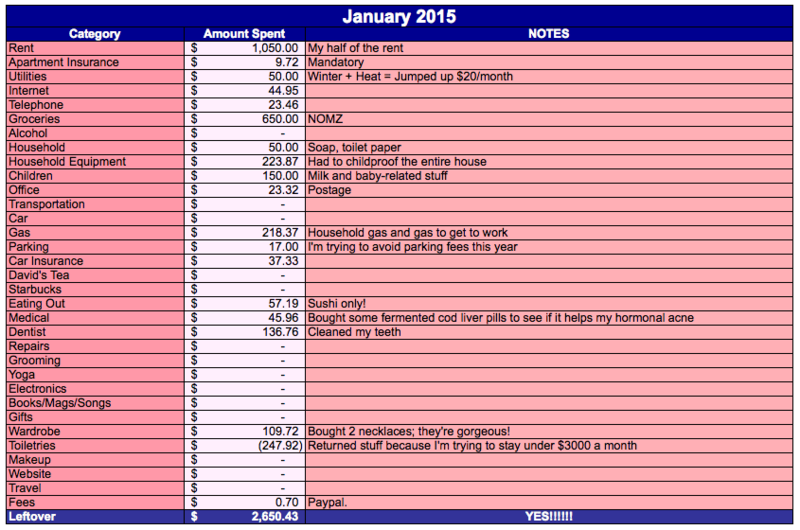 Did you see my awesome list of expenses above? I ONLY SPENT ON LIVING! I didn’t NOT buy anything, I got 2 necklaces this month. $400,000 will be my goal for the end of the year, or net $100,000 (after taxes) in the bank. Can’t wait until it moves into a whole other stratosphere on this graph. The Bun has been killin’ it too. I’m going to have an awesome 2015. February will be just one of those killer months. Loved your insta though I see some on FB, only some I can comment on. I’m surprised by your ‘cheap’ store jewelery, I suppose I think you have expensive taste, and most of it (I am assuming) would be made in china? Anyhow, I love that you’re in a STEM field from memory and you wear so many dresses. The other crazy thing is, when it’s winter here in Sydney, the heating isn’t warm enough for some of the things you picture wearing in a Canadian winter. A little jealous of this fact! The pieces I kept were made in Vietnam rather than China. The rest I replaced with Etsy versions in silver.. I am in STEM yes and I wear a lot of dresses with girly jewellery. I don’t care if it makes me look “less pro” to some people not being in somber pants and shirts but at least I don’t look boring. I dress for myself. Sorry to hear about your friend 🙁 I can only imagine what her family must be going through right now. That’s all I thought about and have been thinking about. Sorry to hear about your friend. Crap can happen anytime. Yeah it helps when you make a good income like I do. It was. Came out of the blue. She was my age.. and she had kids like me. I know but you know how sometimes people get into this bubble and can only see what’s happening in that bubble? That’s me. I have to snap out of it. How awful about your childhood friend! It really puts everything into perspective doesn’t it? I only recently joined instagram as well. I didn’t think I would like it but I do! I mostly take pics of the food I make myself. I just don’t seem to whip out my phone on many other occasions. Ditto! What’s your instagram account?